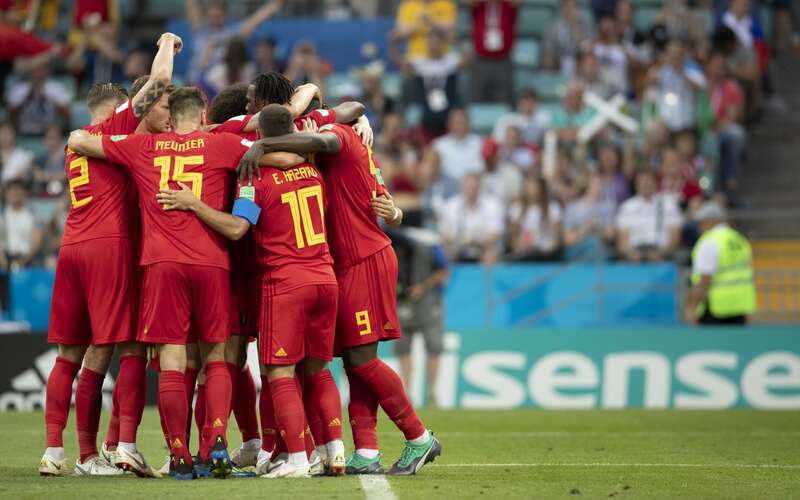 Belgium are on the verge of qualifying for the last 16 of the World Cup after a 5-2 win over Tunisia at the Spartak Stadium in Moscow that leaves the north African side on the brink of elimination. The defeat means Tunisia, who have not won in the World Cup since 1978 - a run of 13 games - will exit the tournament if England pick up a point on Sunday against Panama. Hazard scored with a sixth-minute penalty kick he earned by being tripped, and Lukaku angled a low, left-foot shot into the corner of the opposing goal. Tunisia hit back two minutes later with a Dylan Bronn header as Belgium's own sometimes shaky defending was exposed but another misplaced Tunisian pass enabled Thomas Meunier to feed his goal-hungry striker as Lukaku clipped in to make it 3-1 in stoppage time. Farouk Ben Mustapha is expected to be his replacement. Belgium and England clash next Thursday in their final Group G match in Kaliningrad in a contest likely to decide the pool victor. Yannick Carrasco came agonisingly close to adding a fifth goal when his whipped effort from outside the area fizzed agonisingly past the post, while substitute Batshuayi saw an effort cleared off the line by Yassine Meriah after he had rounded the goalkeeper.